This deep fried Oreos recipe was a huge hit at my friend’s birthday party today. To commemorate the big day, we decided to make them with Birthday Cake Oreos. While I’d heard others rave about a similar recipe, I didn’t know firsthand how to make deep fried Oreos and hoped it wouldn’t be too time-consuming or messy. To my relief, they were extremely easy to make and the delicious outcome was somehow even better than Oreos on their own. Something I confess I didn’t think possible until I took my first bite. What a bite it was! The light crispy batter coating dusted with powdered sugar paired with the crunchy dark chocolate cookie and creamy birthday cake filling delighted the tongue. Before I could blink, we were all munching on a second cookie and oohing and ahhing at the unbelievable taste. Don’t miss out on these other amazing deep fried recipes like these Deep Fried Pickles. You will also fall head over heels for these easy to make Oreo Chocolate Cupcakes. 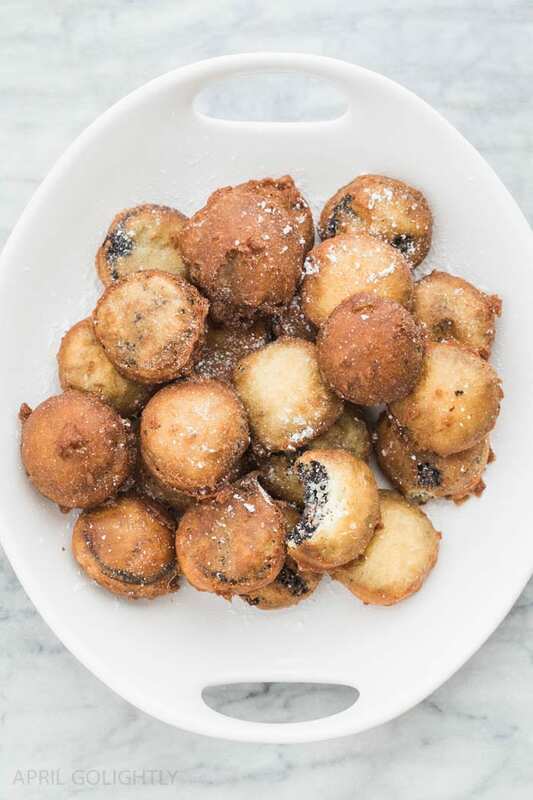 There’s nothing like these Oreo treats fresh from the fryer, and this is one of our favorite recipes that’s so incredibly tasty that it makes the perfect treat for any party, potluck, or a convenient dessert choice for a dinner get-together. You need to start keeping a package of Oreos in your freezer just in case. Deep frying Oreos transforms them into a homemade treat you will be making again and again. Deep Fryer (While you can make deep fried cookies without a deep fryer, I highly recommend making the investment in this kitchen appliance for around $36!). Deep Frier Thermometer (preheat your deep fryer to about 375°F). Pour the frying oil in the fryer. Heat the frying oil until it gets to 350 degrees F.
Remove 2 Oreos from the package, break up these two cookies and set aside. Mix 2 cups of Original Bisquick Mix, with 1 cup milk and 2 eggs. Add the pieces from the 2 broken up cookies to the mix and whisk. Take the Oreos out of the freezer. Dredge the Oreos in the pancake batter. Use a slotted spoon to lower the frozen Oreos coated in pancake batter into the fryer. Fry the Oreos for 2 minutes on each side. You can flip them in the hot oil by pushing on one edge of the Oreo. Line a large plate with two paper towels to drain and blot off excess oil when they are removed from the fryer basket. Lift the basket from out of the frying oil and let sit for a minute so the oil can drain and the fryer basket can cool. Flip the basket over dumping the cookies on to the paper towel-lined plate. Sprinkle with powdered sugar, serve and enjoy! Place the rest of Oreos in the freezer while you make the pancake mix. Follow the Directions on the side of the Bisquick box to make classic pancakes. Mix 2 cups of Original Bisquick Mix, 1 Cup Milk, and 2 Eggs. Add the 2 broken up cookies to the mix and whisk. Whisk the batter together again. Use a slotted spoon to add them into the fryer. Fry the Oreos for 2 minutes on each side. You can flip them by pushing on one side of the Oreo. Flip over the basket on top of the paper towel lined plate. Serve with powder sugar on top. These Oreos look amazing! I can’t wait to try. I love the fried oreos and especially the birthday kind. Pingback: Ultimate Mint Oreo Cake Recipe - Birthdays or Any Day!